Sometimes children follow in their father’s or mother’s footsteps, but in Jake’s case, he’s following in his Uncle Ben’s footsteps. (Especially since his father stepped away and disappeared from the family business 4 years ago. We still can’t locate him.) 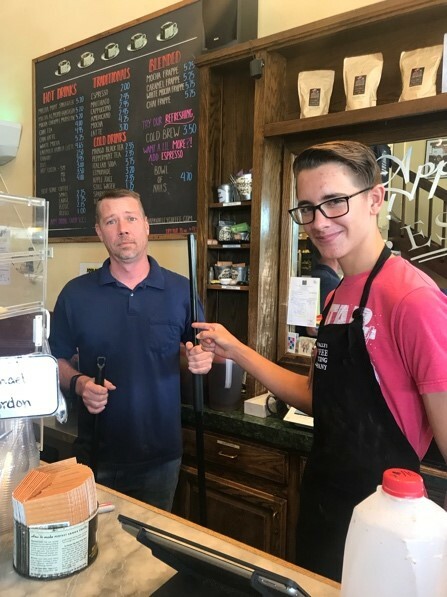 Jake might not have been blessed with his Uncle’s name at birth like his older brother was, but he is the nephew that flies up from San Diego to spend a couple of Summer weeks with his Uncle Ben just so he can learn the family business—Napa Valley Coffee Roasting Company. At just 14 years old and entering his freshman year of High School in 1 month, while his friends are hanging out being teenagers (God help us all), Jake is choosing to further his resume, knowledge, skills, and bank balance. An added bonus? Spending free time with old friends and Uncle Ben in Napa Valley. Last Summer Jake learned how to roast beans, and this Summer he naturally took to the espresso bar. Easiest drink to make? A latte. Favorite drink to make? The Shakerato. I highly recommend ordering both and enjoying them. When he’s not making drinks, he’s cleaning, roasting beans with Uncle Ben, telling Doug at the Napa store what to do, and taking care of customers immediately when they walk through the door. He’s a natural, but it seems to run in the family. What is it about the family business that interests Jake? He loves how everything works. When he was younger he use to come to work with his Dad. He enjoyed watching the interaction of the employees with the customers, the making of the drinks, etc., and that stemmed a fascination for the business which has been brewing since the beginning. When Jake returns home to San Diego he’s looking forward to starting high school, playing water polo and lacrosse for the school, and spending time with friends. He’s hoping to make the varsity lacrosse team this year so he and his brother Ben can play one more season together before Ben graduates. Cheers to you Jake, and all of your future endeavors. We look forward to seeing you at the NVCRC locations in the future! Drink Coffee & Help Writers!